Mount Michael News Archive 2011-2017: Robotics Team Places 3rd at U.S. Open National Robotics Tournament. Robotics Team Places 3rd at U.S. Open National Robotics Tournament. 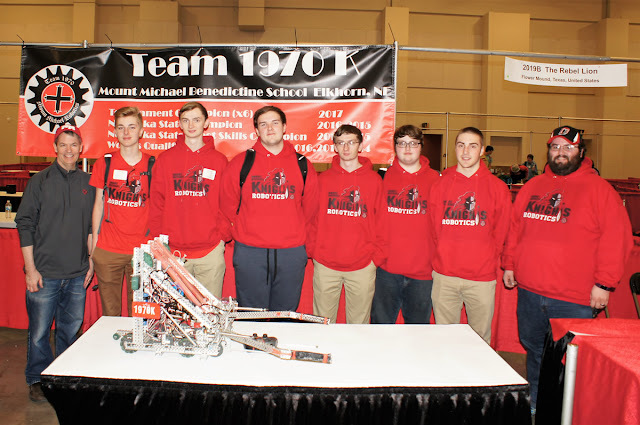 Congratulations to the Mount Michael Robotics team, Knight Shift 1970K. At this year's CREATE U.S. Open National Robotics Tournament, April 6-8, with 175 high school teams from the U.S., Canada, and as far as China, the team placed third in the national event. Next stop is the VEX Worlds Robotics Tournament in Louisville, KY later this month. Go Knights!